This two part rollicking tongue-in-cheek film noir mystery begins in 1951 in Eda City, a small metropolis in the Mid-West. Retired detective Phillip Bartlow has made a name for himself as the city's only Culinary Private Eye. In Part One, The Maltese Mystery Meatloaf, Bartlow is hired by a beautiful young lady to hunt down an up and coming new chef who is serving his patrons dry meatloaf. Bartlow is thrown into a comic adventure which brings him in contact with a cast of characters that include local gangsters, restauranteurs, angry police and a psychotic murderer. In the midst of this tangled web of crime and mayhem, our hero suddenly finds himself falling in love with his secretary/research assistant, Connie. Part two, The California Honeymoon Caper finds our now newlyweds, Phillip and Connie Bartlow, traveling cross country to spend their honeymoon in San Francisco and at Connie's aunt's caper farm in Santa Rosa, California. Phillip and Connie find themselves caught up in another perilous, but humorous, adventure involving revenge, murder, and exploitation by the unsavory characters that they meet on the train. 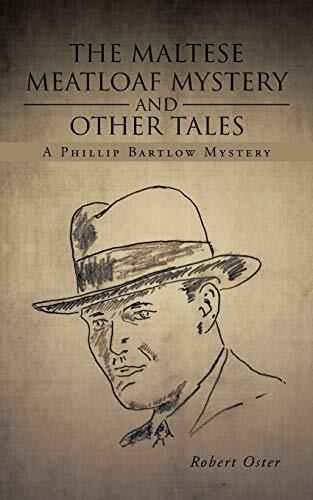 Robert Oster is the author of The Maltese Meatloaf Mystery and Other Tales. Prior to his literary career, Dr. Oster, a psychologist specializing in R.E.B.T. (Rational Emotive Behavioral Therapy) and hypnotherapy, had presented a countless number of courses, seminars, workshops and training programs in the areas of stress management and burnout prevention, chemical dependency treatment, customer service, program development and team facilitation at colleges and to public and private sector organizations for over thirty years. Robert lives in Central New Jersey with his wife Judy, a college instructor.